This high-quality Turkish cotton towel set offers thick, absorbent material that dries you off quickly after your relaxing bath or shower. Following a refreshing bath, envelop your body in luxuriously soft long-staple Turkish cotton fibers. Woven to 700 gsm using superior absorbency and performance. Disappointing quality. Even at Overstock, I understand you get what you pay for, so I wasn’t expecting luxury towels. The first impression was good: color was uniform & true to description, towels were thick and edges were square. Prior to use they were washed once on a short gentle cycle and dried to damp on perm press cycle. Upon removing them from the dryer, found the long edges on all bath towels shredded an unraveling. Wash cloths and hand towels were fine. If they couldn’t survive one gentle wash prior to use, then they’re pretty much useless as anything other than pretty rags. I would NOT recommend. 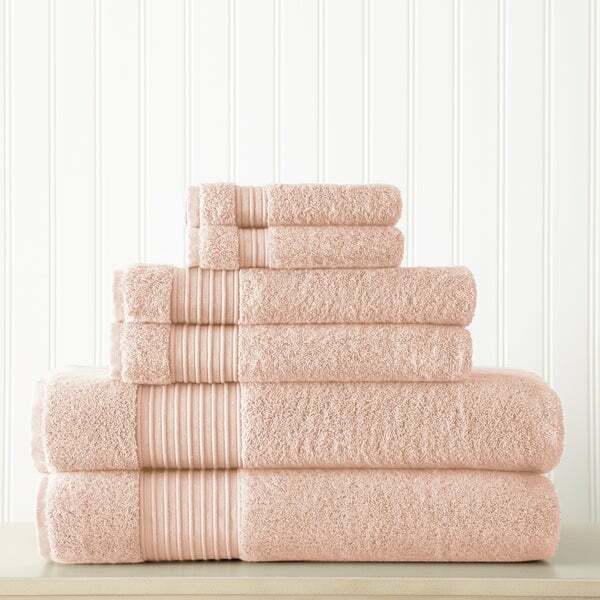 I bought these towels in blush which is a light pink. I love the color. I love that they are soft and 100% cotton making drying easy. They are perfect for my new bath! Awesome buy! These towels are soft, absorbent and dry quickly. You don't know your towels are worn out until you buy new -- and these are a bargain for Turkish cotton. I'm pleasantly surprised at the color of these towels. I ordered the pink which turns out to be the blush. It is more on the pink side rather than the peachy side which pleases me because I was looking for more of a soft pink. These towels are pretty plush about a 9 on my plushness scale. However they could get softer. I'm hoping maybe with a few washes they will get softer over time. But for now I'll give them about and eight. These are the most plush and comforting towels I have ever felt. I have stayed in high class hotels all over the country and these towels compare to the very best that I have ever used. The price is ridiculously low for the quality o these towels. Beautiful color, soft and absorbent towels. Luxurious! These towel sets are even more soft and washable than advertised here. I will highly recommend purchasing this set any many different colors. They are washable and become softer and DO NOT shed for they appear as if much care has been put into the manufacturing. Thank you. These textile companies put these towels on here making them sound like a little slice of heaven and usually they all wind up being a whole lotta... Well... hell. Welcome to a sliver of a divine exception to the rule. They STILL shed, pill and bleed, just a tiny little bit, as most towels tend to do. As such, definitely only wash these by themselves for several washes. There can be some snags here and there and minimal pilling so overall? Not a bad buy at all. They are nice, plush and thick (which gets BETTER wash after wash) and I THINK they'll last a year at a minimum, maybe more? For something that I use everyday for something I enjoy greatly, being clean, even when I travel, I'd say I did pretty good on this buy. I'd recommend them. Pro tip: Make sure you wash them in hot water before the FIRST use to help thrwart excessive shedding and bleeding. Never wash them with other clothing you like or with any washable items except towels of the save color batch or you will never get the towel lint off your clothing fully. Just a couple hacks as some friendly advice from a fellow shopper! These towels are so soft and the color is a perfect match to the phots provided. Bought these as a gift for my mom. I got her the blue. She loves them. Very good quality. I bought a set of these towels earlier, and liked them so much I bought this second set in the denim blue. These are great towel sets, very large and thick. I am totally satisfied with them. These are nice, heavy, good quality towels. The blush color is very true to color. I was nervous when I ordered them that they would look too peach or too pink. They were a perfect blush! They are on a towel rack in my bathroom and used for looks so they don't ever get used and only get washed when they start looking a little dusty. I think I've washed them twice and after both times, they still looked fluffy and brand new. the towels are a nice size as all the hand towels snd wash cloths. Good for guests. I just received my towels I can’t believe the quality of the towels they are nice and heavy also they are very soft. I am really glad I decided to purchase these, I will have no problem purchasing more. I would definitely recommend them to anyone looking for quality for a decent price. Very nice and soft towels. Extremely satisfied! Towels are amazing! Super thick , great quality! These towels are great as far as the thickness goes. They also don’t shed at all. These towels are beautiful. The color is even prettier in person and they are so soft. I'm very happy with them! "I don't see a pic for Pink. Is it listed as Blush?" "Is platinum just a darker gray??? " I liked the description and the color. It is a small wedding gift for a second marriage.